The mob mentality that triggered the UK riots and recent stock market crashes are just two examples of the trouble produced by the cocktail of tribes and the influence and impact of the internet. 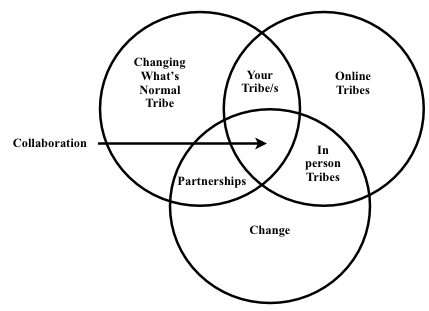 The good news is that tribes and the internet are also forces to be reckoned with for good. Collaboration is at the core of both negative and positive consequences. The diagram above is one simple way to represent what happens. One of the tribes I lead is the changing what’s normal tribe. You can find out more here. I build relationships with leaders of other tribes where there is a aligned purpose with why our tribes exist and therefore opportunity for collaboration is high. One of my subscribers to this blog is Kwai Yu, the Founder of the Leaders Cafe tribe. There is much alignment with the purposes of both our tribes. Another one of my subscribers to this blog is Maria Carlton, the Founder of the Ideas to Authority tribe. Again there is much in common with what Maria’s tribe is about and what the changing what’s normal tribe is about. What tribes do you lead? And which leaders of tribes with an aligned purpose with your tribe are you building relationships with? 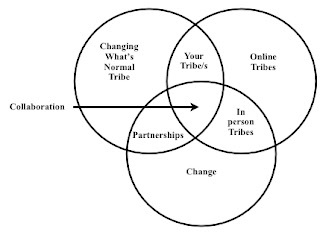 Such relationships lead to further relationships with leaders of tribes online and in person. Out of all these relationships emerge partnerships and through the work of such partnerships change on a massive scale takes place. Could you be a better leader of your tribe/s? Could you do better in building relationships with leaders of other tribes? How many partnerships are emerging from your relationships? I believe we can all do better. And we must. Our world needs positive change on a massive scale right now. For the best talk I know about on Tribes check out Seth Godin’s TED talk below and get your copy of his Tribes book as well. It has a permanent place on my desk!